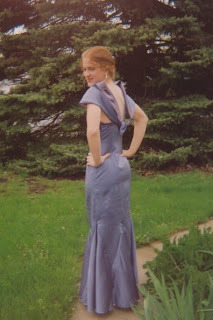 The lilac dress at the end of these photos was the prom dress from last year. April 26 Phil will turn 23. We will celebrate on the weekend when he can have a margarita with his meal. This is a downside of working nights. The next few weeks will be very busy for Cassandra... and that means the rest of us transporting and attending. There is an all city band concert at Central High School on the 26th, 7:00pm. The Hale band concert is on May 2, 7:00pm. The state solo ensemble is at Concordia College on May 5, sometime in the morning. She kept asking the band director to chase down the English Horn the district owns to see if she wants to include the horn with her oboe skills. She brought it home today. As I type she is seeing what it can do. The range is that of my beloved viola. May 11 we will go to a fashion show at Mount Mary College, my alma mater. Hale prom is the 12th of May. Eisenhower prom is the 18th of May. There is a breather for finals and on June 12, 2007 there will be a 6:30 ceremony where Cassandra will graduate from high school. The last picture of this series is Larry at the end of a running cool down. He is mellow and goofy. To the right is the second quilt top Cassie has designed of rec. department and cross country shirts. The first was made this last Summer. We had a snow storm on April 11, 2007. Phil provided the shots of his car and of the street from the upstairs porch. I do love Wisconsin in the Spring. Snow one day. Two days later we were waiting for the last of the snow to melt to cut the grass in the back yard. Today Cassie and I took a daytrip to Manitowac. She scheduled her placement tests for Plattevile at the Mantowac UW campus. Somehow this makes sense. I spent the time enjoying the day. There are no pictures. I wish I had taken the camera... but I never considered it. I did some shopping and went back to the campus before the tests were over and took a walk. The campus is on Lake Michigan. There looks like there is a cross country route designed into the campus along with areas designated for wild flowers and a fenced in bat colony. I used a wheel chair ramp to go down to the lake. The shore is covered with these 1" clam-type shells that cracked and crunched wherever I walked. The lake was a darker and bluer version of the sand near the shore and eventually became it's familiar steel blue before it hit the horizon and the sky took over with it's blues and light spots of clouds. I was surprised that there were people on the lake in what looked like row boats, fishing. One guy was leaning way over the side of his boat pulling something in. I wondered what would happen if the lake pulled back. I am more comfortable with the lake from the shore. Today was a crisp Spring day. What a contrast from the blizzard I drove home through on Wednesday. The only signs of saw left of that late Spring surprise was the occasional snow bank and the flattened daffodiles that were in bloom when the storm hit. It was a beautiful day.